I'm doing the Happy Denim Dance right now. 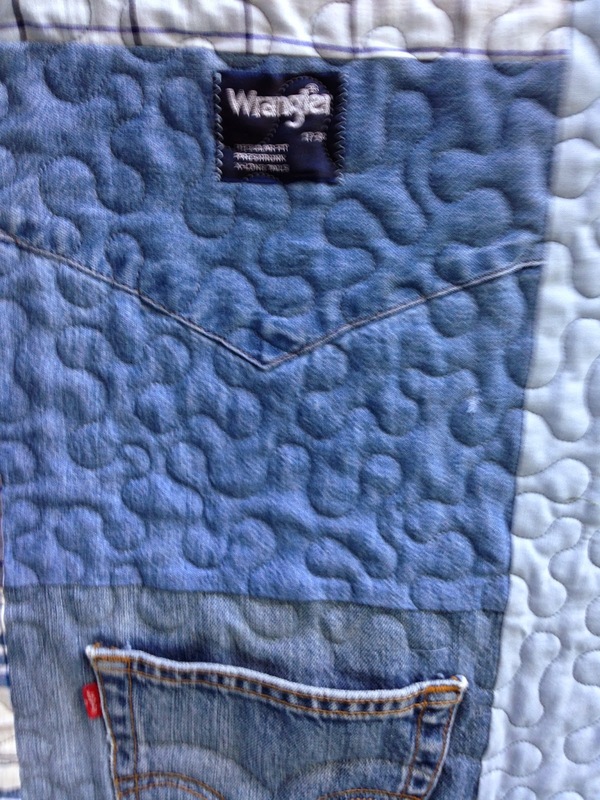 I finally finished the last denim quilt I was commissioned to make. You may recall I've already made 2 of the 3 quilts. This was the first one. 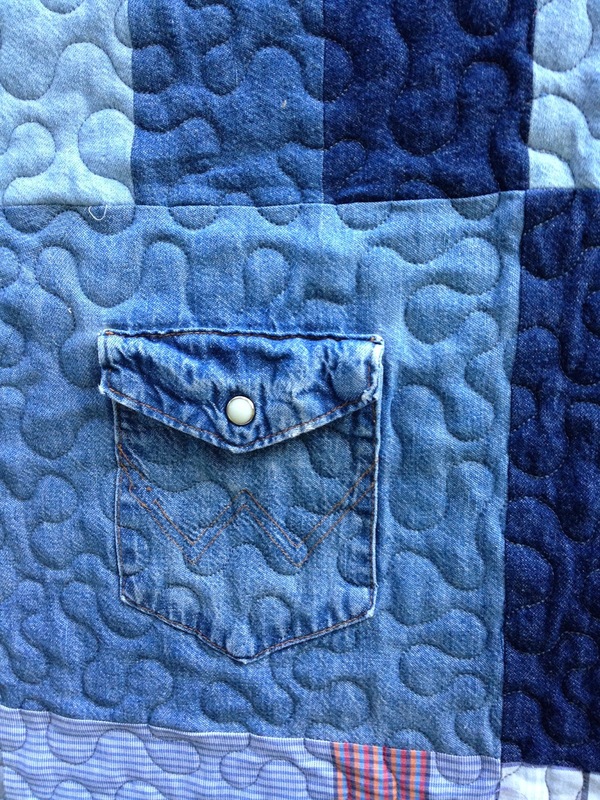 It's hard to think of creative ways to make a memory quilt from denim jeans and old shirts. The shirts were very thin and not 100% cotton and sewing them next to a heavy weight denim was not a good mix. It had lots of challenges. 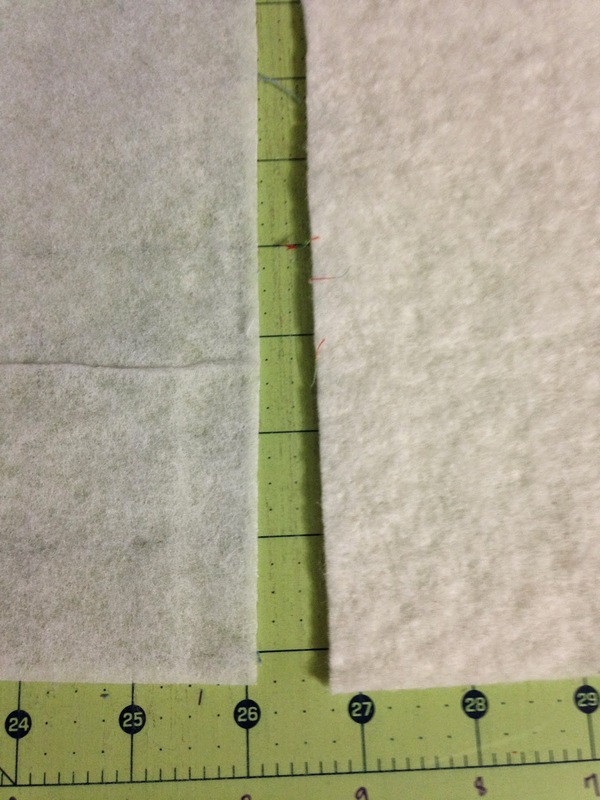 Hind sight is 20/20 and looking back I should have stabilized the shirts with a light weight iron on stabilizer like tricot interfacing that I use on t-shirts. But I didn't and the quilt is finished just the same. This is the third one. I started with a large nine patch block. Each square is 9" finished. Then added a row of piano key blocks to make it rectangular instead of square. 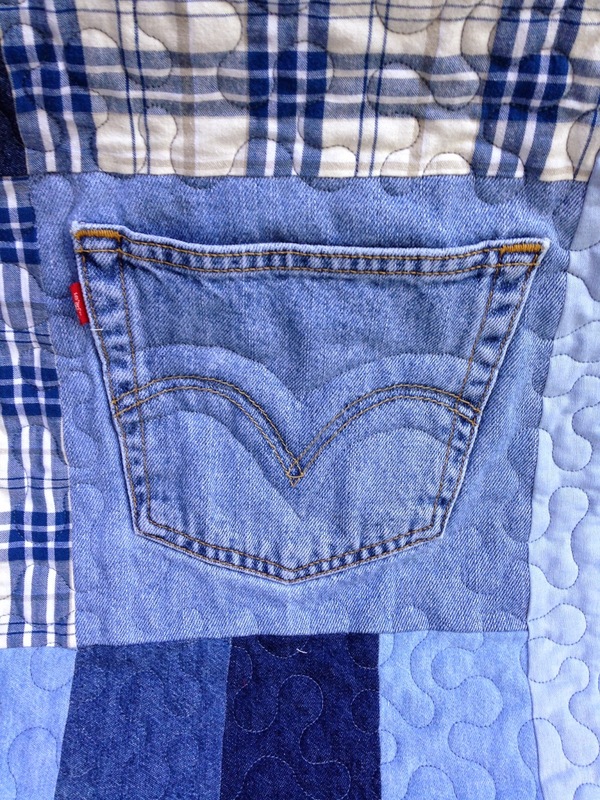 Added a border of chambray fabric and then a final scrappy border of denim. Now here's where the creative part comes in. I took the label off the waist band of the jeans and sewed it to a denim square. Another label from the waistband of a different brand of jeans. And then I took the label from the inside of a shirt, removed it and re-attached it to the outside of the shirt western yoke. Another tag from the shirt removed and re-attached to the outside back western yoke. And yet another tag re-sewn. The jeans pocket. I could stitch through the entire pocket. 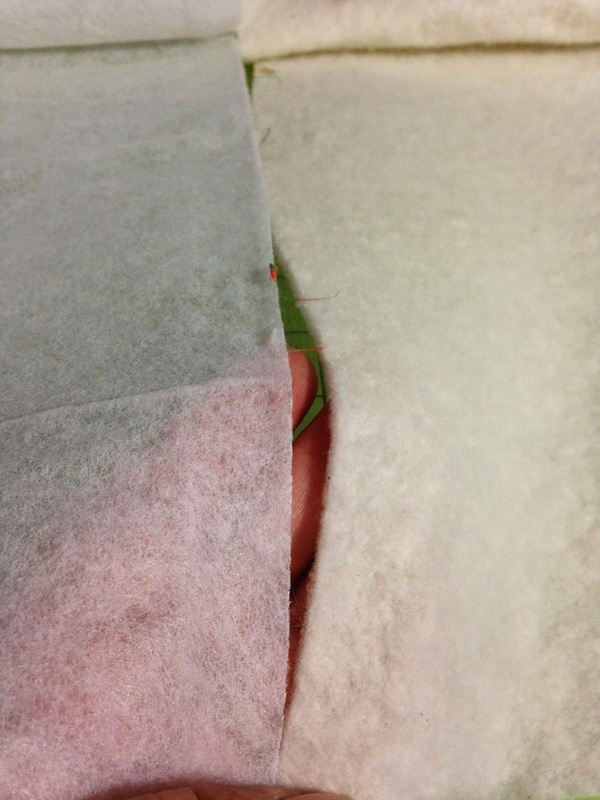 The hopping foot of Queenie wouldn't go over all the edges of the pocket. 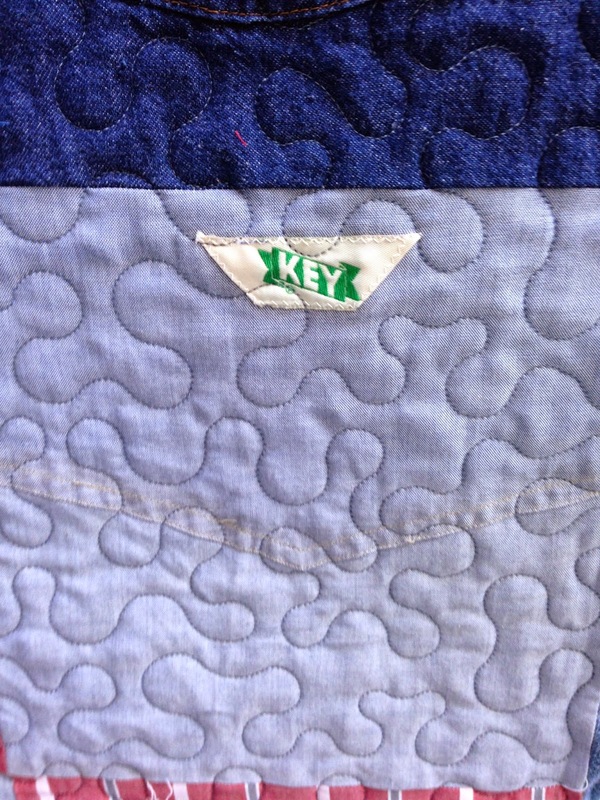 I quilted around it and then went back and echo quilted the top stitching across the pocket. 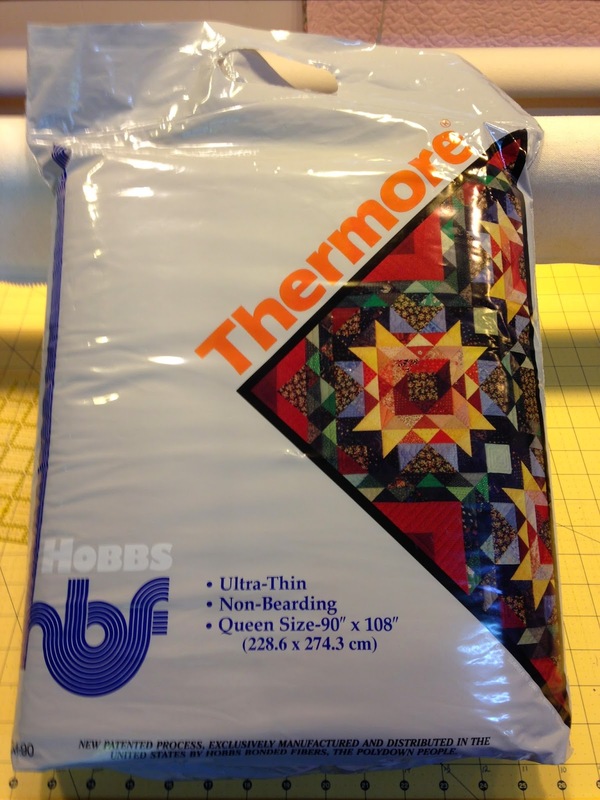 You may remember that I won a package of batting as a door prize at the Quilt Retreat at Deep Woods last weekend. It's "ultra-thin" and since the denim was so heavy and my customer really didn't want me to use any batting at all, I decided to give this one a try. I think I like it. I really is "ultra-thin". I don't know if you can tell from the photos below but it is. I laid it next to my regular Hobbs Heirloom 80/20 batting that I would have normally used. 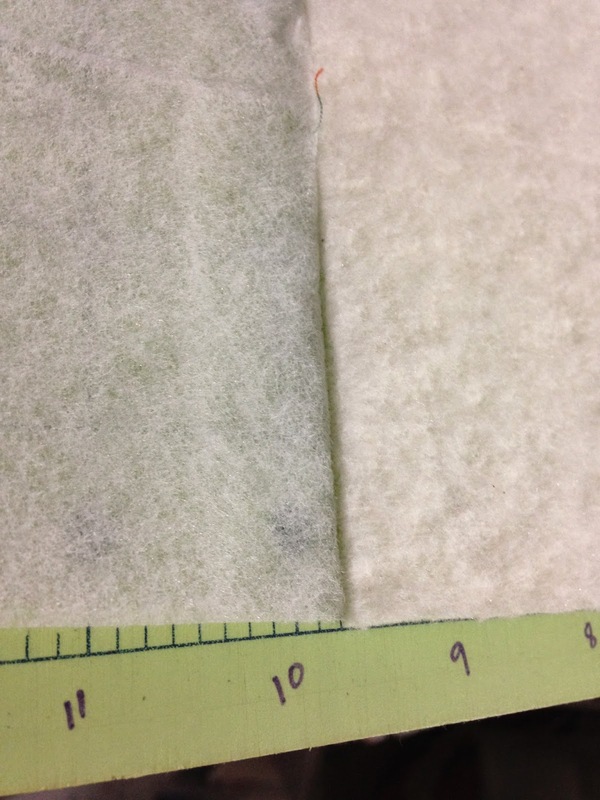 Notice the difference in the thickness of the two? You can see my hand through the Thermore "ultra-thin" batting as oppose to the 80/20 batting. I will definitely be using this again. The girls at the retreat said it was great for t-shirt quilts and I bet they're right. I'm going to try it on the next t-shirt quilt I get. 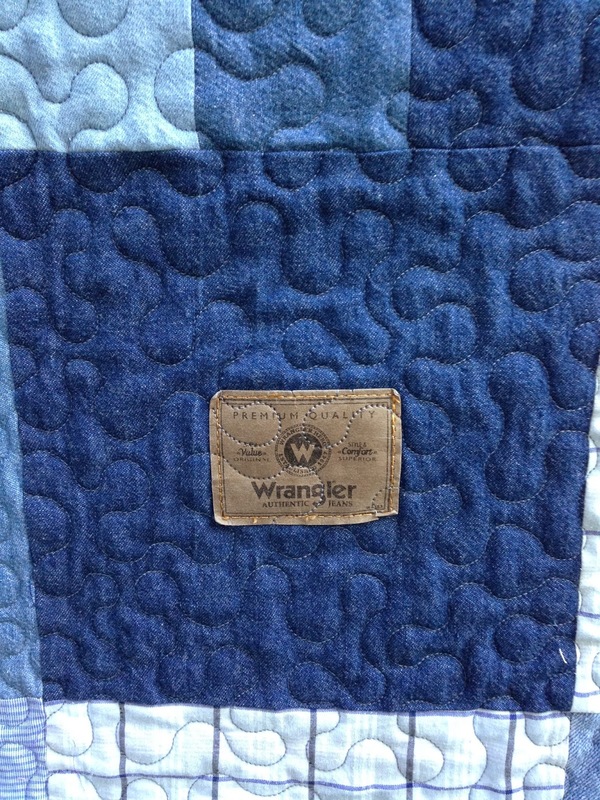 Your little details really do make this denim quilt extra special. 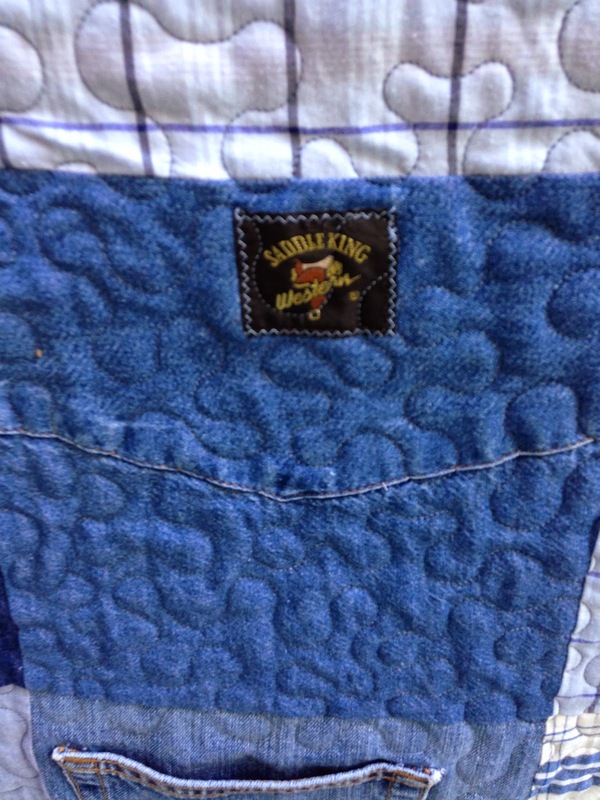 Love your quilting on that pocket. 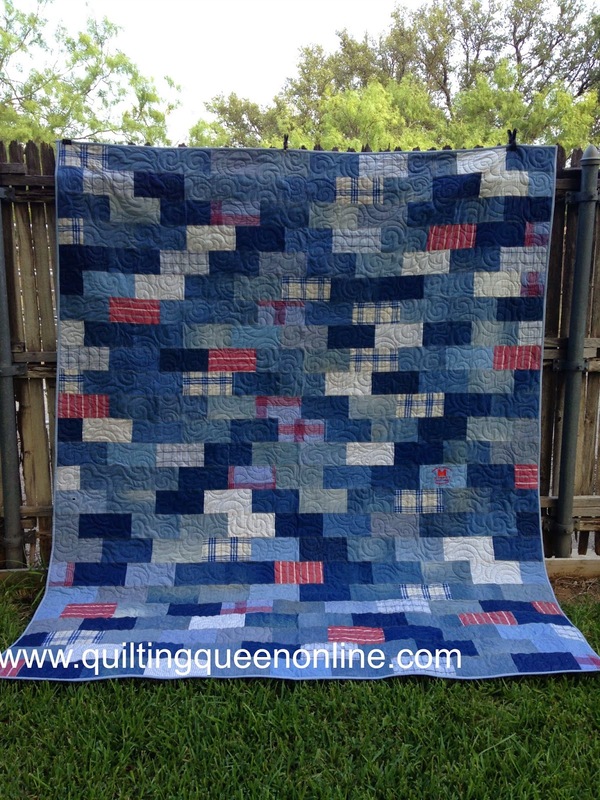 That is a great way to solve the quilting problem. Very nice work. 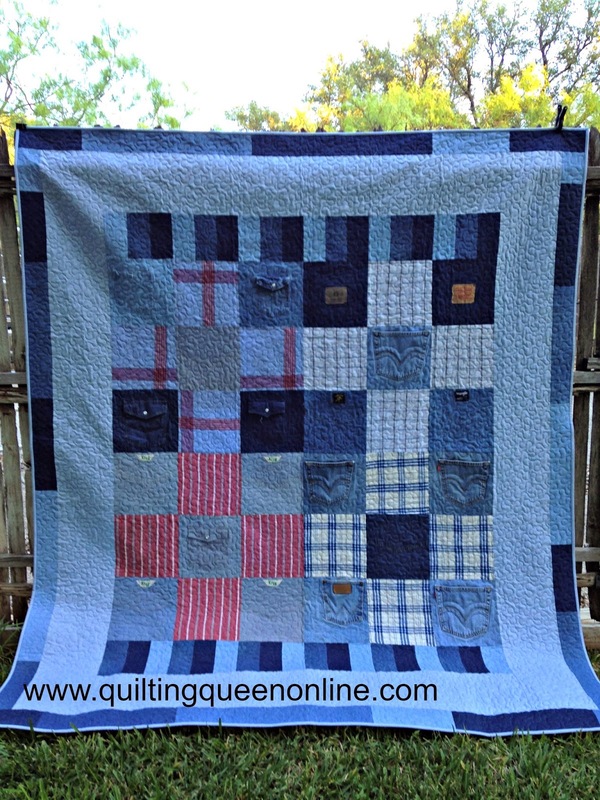 I love all your added details and quilting...very cool! I haven't seen the thin batting, but there have been projects I've made that would have been so much better with thinner batting. I'll have to get me some of that! wow these are really lovely quilts. You did a great job. Thanks for sharing about the batting. 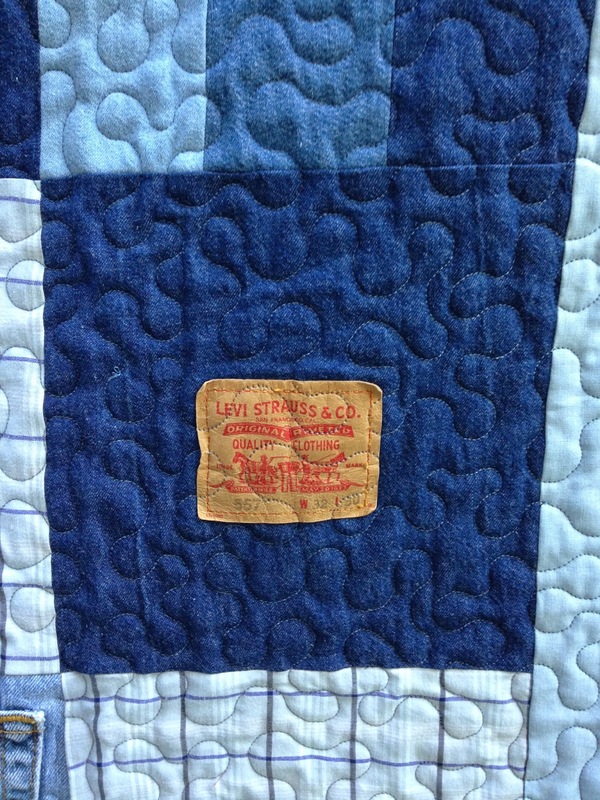 Love all the labels you incorporated into the quilt - just the best added touch! !